Nothing like a random party at the Rivington Hotel! +Chill Marketing Group throws the best parties and their holiday party was no different. Happy birthday Kevin! Tons of cool people, a slow open bar and lots of balloons. Now that I have been to a few NY parties where there are helium balloons everywhere, I am convinced that balloons are the new cupcakes. Today I went out on the street and saw 7000 Santas! Did you know it’s SantaCon! 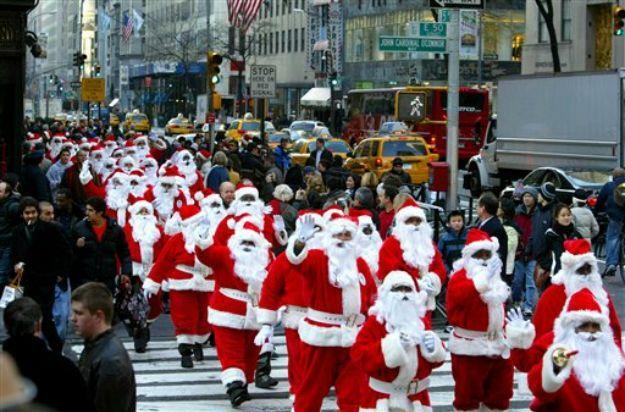 It is the biggest mass gathering of people dressed as Santa Claus… So cool right? It’s madness out here. Happy holidays..
“SantaCon is a not-for-profit, non-political, non-religious & non-logical Santa Claus convention, attended for absolutely no reason”, says the description on NYC Santa Claus official web page. (NY) Charmin Po(o)p Up Store! I went by 42nd street today for a meeting and I came outside to this! The Charmin Pop Up Toilets! The cold weather always makes me want go to pee to I had to go check it out. Each mini toilet was equipped with 3 kinds of TP for your pleasure. I use the Ultra soft at home so I tried to Ultra Strong to see what that was all about. The Charmin Toilet Photo Op! I love pop up stores! I also love experiential marketing. I had a good chat with the reps Larry, Kevin and Donny. Outgoing, friendly and super helpful. Donny offered to pose with me! Prom time lol – It’s a giant toilet! So fun – The outside is gold, there a 2-step thing to climb up to the ‘throne’. To make you laugh, the reps say.. come on, let it all out >_< ew. Ha ha ha! For more, follow them on Twitter @EnjoyTheGo: Dedicated to making going to the bathroom more enjoyable. We all go. Those who go with Charmin, really Enjoy the Go. I was on the F train last week heading to the Pro Keds event and I saw this fine fella. I noticed his square handkerchief in his blazer pocket, I noticed his Varvatos-esque boots and of course his fingerless gloves. But more so it was his magnetic aura that interesting people all possess. Anyway, in my previous post about how ‘he has to match my fly‘ – I am always amused when my thoughts manifest into reality. I got off at 2nd street and left for the event. Then I called Joey telling her I swear I felt like he wanted to talk to me too lol. But I was too chicken. So here is the twist of Guy #4… you ready? HE WAS HEADING TO THE SAME EVENT. So anyway needless to say, he is just as awesome as I thought. Justin Bridges, stylist and owner of Tucked LLC. In September, I bought a coat from TopShop. I kinda splurged but I really loved it. But have 2 months of being with me in LA, TO and NY – the pocket decided to rrrrrrrrrip. Sad to say, I had to bring it back to TopShop. They were so nice and helpful and told me I can exchange for something of equal value.